YG Series 3-Phase Asynchronous Motor Used in the Roller Way adopts the self cooling construction, which replaced the pervious generation of JG2 series motors. 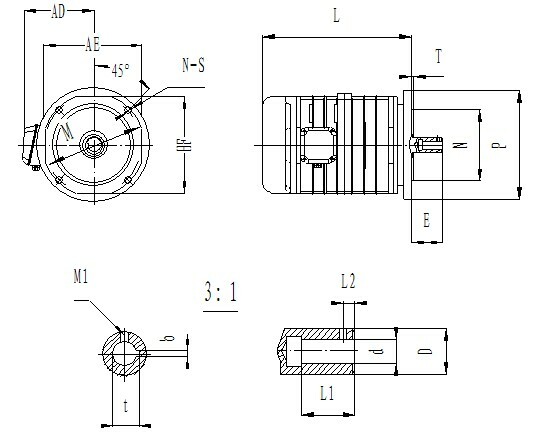 This series motor can be divided into two sub-models, namely, YGa and YGb according to their usage. The YGa series motor is suitable for driving roller of the roller way in the metallurgical industry，as it has a large braking torque, high dynamic constant, soft mechanical performance, and suitable for frequently starting, stopping and inverting capacity. The YGb is used for driving the conveying roller in single direction in the metallurgical industry, due to it features large power, high efficiency and hard mechanical performance. YG series motor is capable to start under normal voltage condition; therefore it is not necessary to reduce starting voltage, eg. It can be started at 380V and 50Hz. Under condition of the voltage changing in the positive proportion to the frequency, the YGa series motor is allowed to operate freely at range from 40Hz to 70Hz, while the braking torque and dynamic constant varying correspondent to the change of the frequency. The YGb series motor is capable to operate in variable speed and constant torque within the frequency range of 10Hz to 70Hz. The mounting dimension of the YG series motor meets the IEC Standard. The protection for its outside layer is IP54, and cooling method is IC041. YGa adopts Class H insulation. However, YGb uses Class F insulation for frame height between 112mm to 200mm while Class H insulation for frame height of 225mm. YGa series motor mainly operates non-continuous duty. Its duty cycle can be selected from one of duties corresponding to the braking torque shown in the table below. The ratio of duty cycle is represented as FC. It can be specified in 15%, 25%, 40% and 60%, among those ratio 40% is considered as the basic cycle. YGb series motor mostly operates under continuous duty. The selection of its duty cycle demonstrated in the table below. 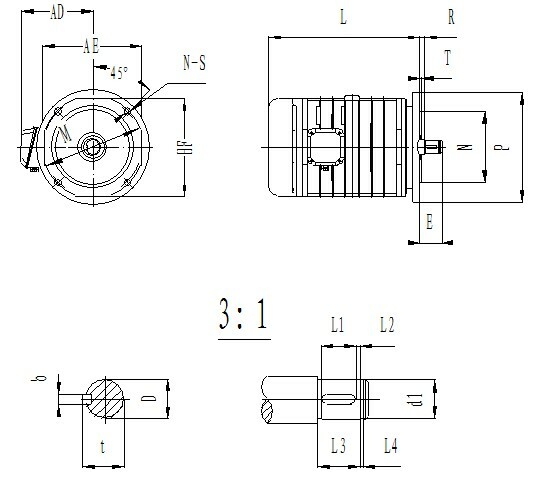 Compared with YG Series 3-Phase Asynchronous Motor Used in the Roller Way, YGEJ Series 3-Phase Asynchronous Motor with Brake Used in the Roller Way has the same features and functions as YG series motors, but it is added a build-in AC brake. The AC brake is powered directly from a three phase power supply without rectified diodes. The AC brakes are not only quick response braking (100 times quicker than a DC single phase brake) but also have improved reliability and long service life. The advantages of AC brakes also include precise positioning, such as no axial movements, and the capability of a wide adjustable range of braking torque, such as from zero (0) to any desired values. The AC brake is an approved patent from the National Patent Bureau. The approval patent number is: 97206492.3.